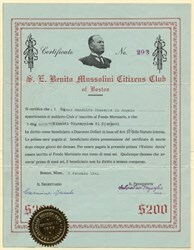 Unusual historic certificate from the S. E. Benito Mussolini Citizens Club of Boston issued in 1941. This historic document has an ornate border around it with a vignette of a headshot of Benito Mussolini. This item has the printed signatures of the Company’s President, and Secretary, and is over 69 years old. Benito Amilcare Andrea Mussolini, KSMOM GCTE (29 July 1883, Predappio, Province of Forlì-Cesena - 28 April 1945) was an Italian politician who led the National Fascist Party and is credited with being one of the key figures in the creation of Fascism. He became the 40th Prime Minister of Italy in 1922 and began using the title Il Duce by 1925. After 1936, his official title was "His Excellency Benito Mussolini, Head of Government, Duce of Fascism, and Founder of the Empire". Mussolini also created and held the supreme military rank of First Marshal of the Empire along with King Victor Emmanuel III of Italy, which gave him and the King joint supreme control over the military of Italy. Mussolini remained in power until he was replaced in 1943; for a short period after this until his death, he was the leader of the Italian Social Republic. Mussolini was among the founders of Italian Fascism, which included elements of nationalism, corporatism, national syndicalism, expansionism, social progress and anti-communism in combination with censorship of subversives and state propaganda. In the years following his creation of the fascist ideology, Mussolini influenced, or achieved admiration from, a wide variety of political figures. Among the domestic achievements of Mussolini from the years 1924–1939 were: his public works programmes such as the taming of the Pontine Marshes, the improvement of job opportunities, and public transport. Mussolini also solved the Roman Question by concluding the Lateran Treaty between the Kingdom of Italy and the Holy See. He is also credited with securing economic success in Italy's colonies and commercial dependencies. Although he initially favoured siding with France against Germany in the early 1930s, Mussolini became one of the main figures of the Axis powers and, on 10 June 1940, Mussolini led Italy into World War II on the side of Axis. Three years later, Mussolini was deposed at the Grand Council of Fascism, prompted by the Allied invasion. Soon after his incarceration began, Mussolini was rescued from prison in the daring Gran Sasso raid by German special forces. Following his rescue, Mussolini headed the Italian Social Republic in parts of Italy that were not occupied by Allied forces. In late April 1945, with total defeat looming, Mussolini attempted to escape to Switzerland, only to be quickly captured and summarily executed near Lake Como by Italian partisans. His body was then taken to Milan where it was hung upside down at a petrol station for public viewing and to provide confirmation of his demise.